The Model 4100 is a patented technology that will feed numerous aqueous chemicals commonly used in municipal and industrial water treatment systems for operations that require high efficiency, control, and safety. The patented JCS Industries Model 4100 Liquid Vacuum Chemical Feeder is for operations that require high efficiency, accuracy, control, and safety. 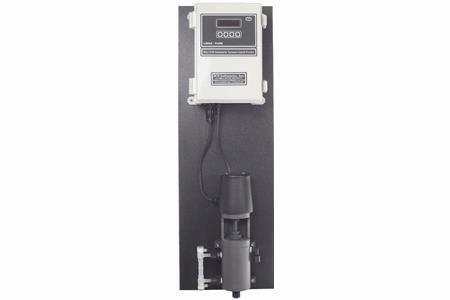 The Model 4100 is a patented technology that will feed numerous aqueous chemicals commonly used in municipal and industrial water treatment systems, i,e, sodium hypochlorite, sodium bisulfate, aluminum sulfate, ammonium sulfate, acids, sodium hydroxide, non-oxidizing biocides, scale and corrosion inhibitors. The system is comprised of a vacuum injector to safely introduce the liquid into the feed-water stream; a reversing servo motor coupled with a V-notch valve to regulate the chemical feed rate; an electronic flow sensor to monitor and regulate the feed rate; and a control module for complete electronic control and communications.